As a retired individual, I have the time to fish. My residence is in the Brentwood Section of Mapleridge. One of my hobbies is to fish. There are three ponds within a short distance of my residence, so access to a fishing spot is not an "event", but only a short walk from my front door. If the fish aren't biting, I can walk home and heat up another cup of coffee! My preferred method of fishing is with a flyrod. 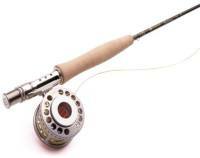 If you are fortunate to catch a fish, the lightness of the flyrod makes for some sport! There is something almost mystical about watching the line swoop out in front of you and landing within a few inches of your intended target. Sometimes you actually cast where you plan to cast and that is an enjoyment all its own. I have been fishing with a flyrod since a youth and picked it back up again when we moved to Mapleridge. If there are members of the community thinking about fishing with a flyrod, I would be glad to show you how. Simply stop me when I am fishing and ask! You could send me an email and we could find a time to meet. The most productive time for fishing with a flyrod is probably in the spring. The ponds are flush with bream, bass, crappie and catfish, although the most of the bass I've fcaught are not particularly large...some are. If you are interested in fishing, come out and give it a try. Be careful of the golfers, as they have first dibbs on the ponds and the anglers should not interfere with their golf. I couple of requests came in to contine the fishing report, so here goes...(most recent fishing trip on top). Early Fall - Late November: The weather has taken its toll on my inclination to fish. Between some vacation trips, the cold and rain, trips to the ponds have been few and far between. I have noticed several more fishermen in recent months trying to bring a few fish back to the banks; some fishermen with some success. Most of my efforts have produced very small bass and a mix of bream from small to large. Some of my 'sweet spots' have not been as productive as in the past. I tried out a 'rig' consisting of wires supporting multiple hooks...didn't like the feel or the results. I probably will put that back on the shelf for another day. Late August-Sept Results: Several small catfish were found spawning around the banks. Contrary to popular behavior, these fish could be enticed to bite a small plastic worm. I caught several (practically hitting them on the head) with a plastic worm on my flyrod. Most were in the 2-4 lb range. I think they were more annoyed by the worm than attracted. Early August Results: The temperature and other factors made me switch to early morning fishing...glad I did! A 5+ pounder made the mistake of striking my bream popper. Flyrod fishing is great fun with a small fish, but awesome with a larger fish. After many, many minutes of strong runs he completed his trip to the bank for a picture and a release. There were a couple of others in the 3-4 lb range as well as some monster bream that got the "free ride".